As parents, it is exciting to see your child take first steps. The walking toy products which encourage your child to go for those first walks around the place are every parent’s fancy. There are different types of walking toys and each comes with its unique features and kid-friendly functions. The walking toy products feature different designs of which some are education-oriented and some are for amusement. Therefore, it’s important that you choose the product which suits your child’s needs the best. Let’s explore the review list of high-quality products you can purchase online. The reviews will help you make a good investment and prove to be a joy for you and your kid. After all, that’s a once in lifetime experience and you want it to be the best one. Why we like it: This walking toy for toddlers features a classic push and pull design which proves as beneficial for children who just started walking. Cossy offers a walking toy which is carefully designed to be a good partner for a child who just made its first steps. This walking toy is visually appealing and younger kids will adore its colorful fox-like design. The toy features rubber-trimmed setback wheels that are meant to protect floors, so the toy is safe both for the child and its surroundings. 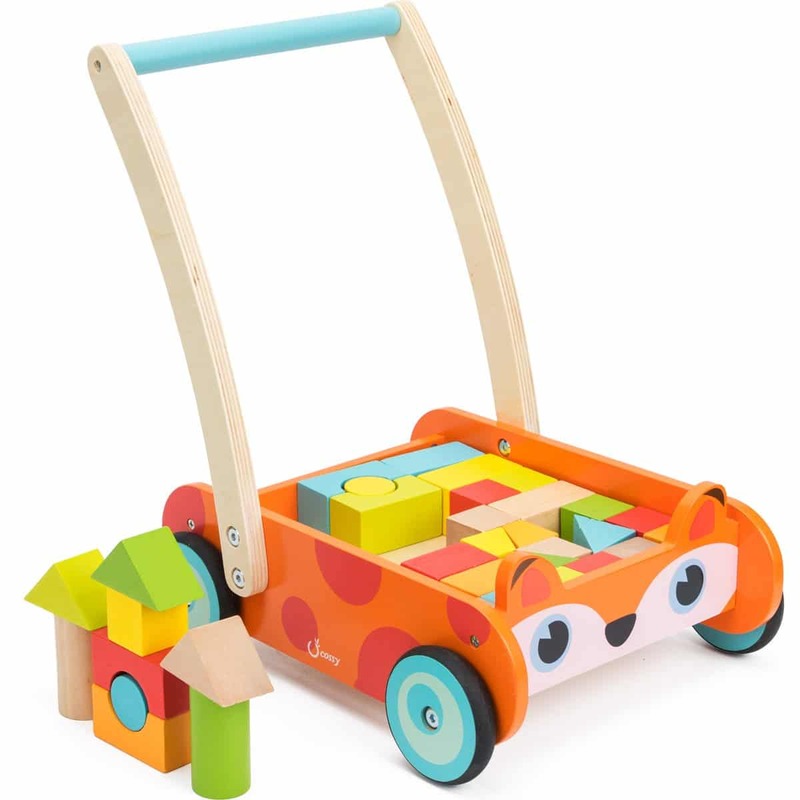 Cossy walking toy has a cart design and comes with building blocks included in cargo part, so your child will be inspired to use the blocks to create its own building and then transport the rest of the parts by pushing the cart. Also, the pushing walking toy cart is made of quality wood materials. This toy encourages your child to make its first steps and transport its toys all around the place. Cossy walking toy features a colorful design which your kid will find adorable. The toy is made of high-quality Dutch wood. The color may wear off after extensive use. Why we like it: Pewi Y-Bike is a unique walking toy that encourages your child to have some physical activity and choose whether it’s going to ride the toy or push it. 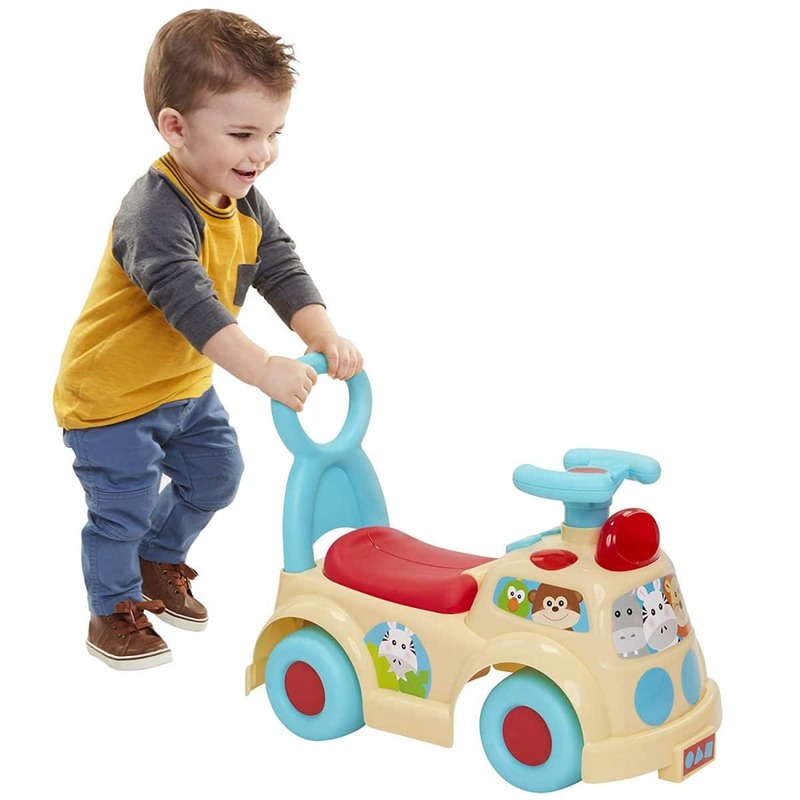 This pushing toy by YBIKE features an advanced educational design that is meant to help children develop their motor skills and start walking as soon as possible. Your child can use YBIKE toy for riding, pushing, sitting, and supported walking as its unique and versatile design allows for different functions and developmental benefits. The toy will improve your child’s motor and cognitive skills, such as balance, coordination and spatial awareness. Also, the toy features a lightweight, durable frame which ensures toys longevity and stable performance. Toy construction features molded plastic seat with soft foam pad, easy grip handle, and multi-directional 360 degrees caster wheels. Toy’s unique design provides your child with great support while walking. YBIKE walking toy will improve your child’s motor and cognitive skills. Your child may be confused about the correct use of the toy in the beginning. Why we like it: Bright Starts walking toy features a funny design which is going to occupy your child’s attention and encourage your kid to walk extensively. 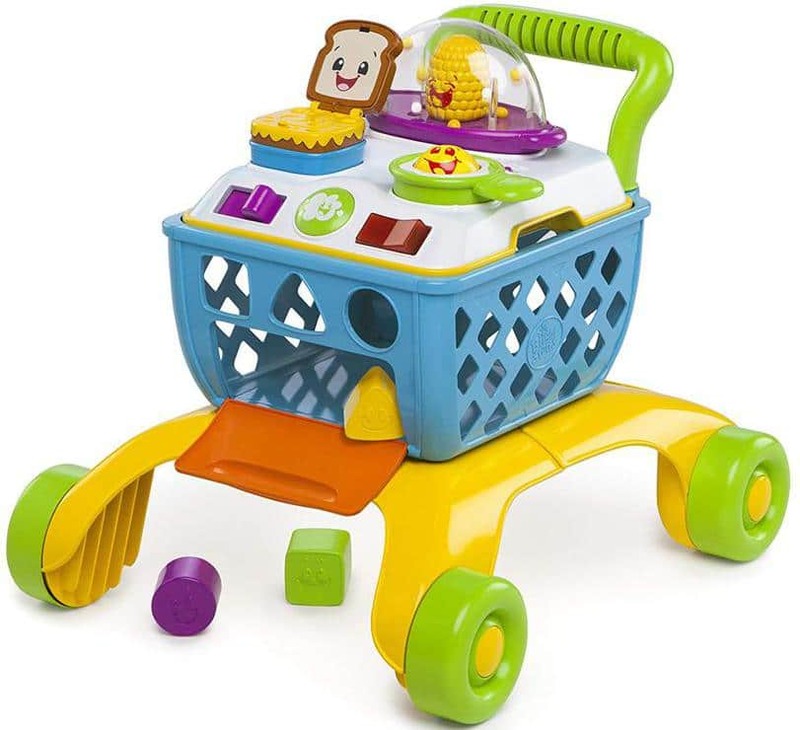 Bright Starts offer a walking toy that has a market cart design with lots of play options included. The toy features 4 stages of play as it has a removable cooktop designed for sit and play mode, and also a stand and play activity table with additional push and walk behind play options. This walking toy is made of durable and high-quality plastic material which is children-safe and doesn’t contain small parts which can be hazardous. Your child will enjoy a light-up button that starts sizzling cooking sounds which are meant to occupy your child’s attention and entertain for a long period of time. The toy is made of high-quality materials which ensure the toy’s durability and optimum performance. Interesting toy design will make your child occupied for hours and will encourage your child to walk and be confident. Different play modes are designed to improve your child’s motor and cognitive development. Some users reported minor problems with detaching and attaching some parts of the toy. Why we like it: Labebe push walker toy features an engaging design which is meant to occupy your child’s attention and help make the first steps confidently. Labebe walker toy for toddlers features a 2-in-1 design which combines toy storage with an upper panel that can be used for different play options. The toy can be used for sit-to-play and stand-to-walk playing modes that both encourage specific sorts of your child’s motor and cognitive development. 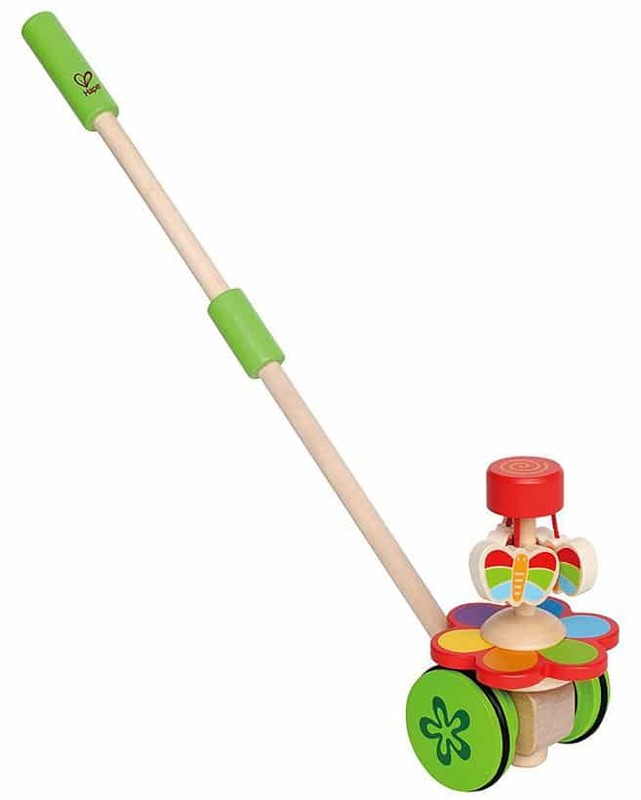 This pusher walking toy features wheels with a rubber ring that is designed to protect floors from scratching. Also, the pusher is easy to maneuver as you can even the weight by putting the toys inside the toy compartment, so the pusher doesn’t fall back once your child lean on its handle. The toy is made of high-quality, sturdy wood and it’s easy to assemble. Labebe walking toy features a great design which is going to keep your child occupied and encourage to walk. Different play modes will enhance your child’s motor and cognitive development. The toy is made of high-quality wood which ensures it’s longevity and stable performance. Some users reported minor problems while trying to put bigger toys in the toy storage. Why we like it: cossy walker toy is a multifunctional education toy which is designed to benefit your child’s overall physical and mental development. This baby push and pull toy is mainly designed to support your child while it’s making its first steps. The engaging design is meant to occupy your child’s attention and help focus on different playing modes which benefit different sorts of motor and cognitive skill development. The toy is intended to improve your child’s mental capabilities by offering various play options on the front panel of the pusher. On the front panel, you may find a tiny xylophone that is meant to introduce your child to playing music and also there’s a tiny mirror featured which should help your child develop the awareness of its own identity. This toy is designed in a way to encourage your child’s first steps and its overall mental and physical development. The toy is made of high-quality wood materials. Cossy walker toy features many play options that will occupy your child’s attention for hours. Some users reported problems with color wearing off after extensive use. Why we like it: Melissa & Doug walker toy will benefit your child’s physical development as it’s designed to encourage kids to start walking and gain confidence while on foot. This walking toy features an engaging design which is supposed to keep your kid occupied and eager to explore the environment. 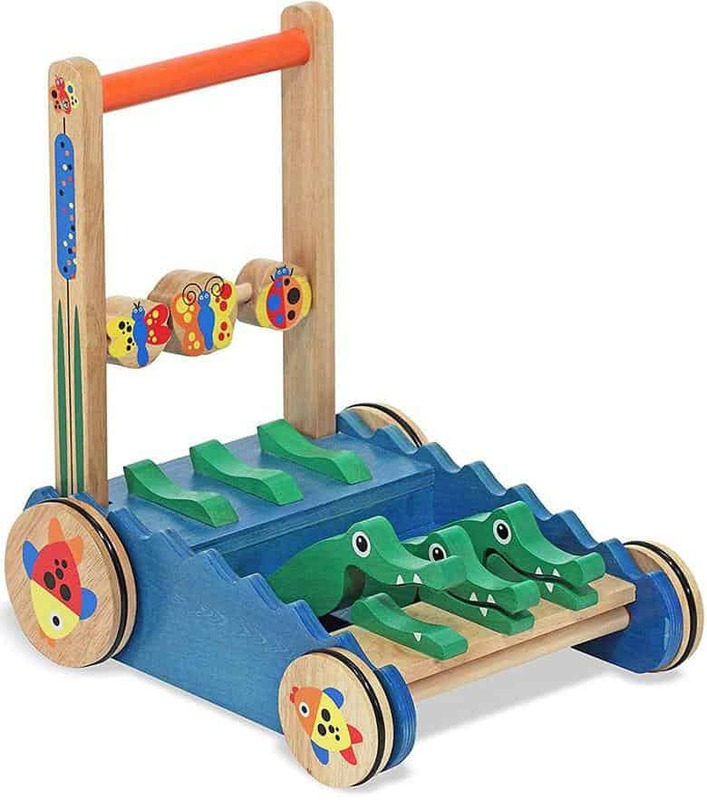 The toy features push and pull design with three chomping alligators in the front. Melissa & Doug toy is made of high-quality wood material which ensures the toy’s longevity and optimum performance. Your child will be amused by gentle clacking noise this toy produces when moved. This toy is meant to improve the development of your child’s fine motor and cognitive skills like color recognition and understanding of how the simple mechanisms function. With Melissa & Doug walking toy, your child will have screen-free fun that will benefit its overall development. Melissa & Doug toy features an attractive design which is going to attract children’s attention and keep them occupied. The toy encourages your child to make its first steps. This walking toy is made of high-quality wood and it’s durable. Some users report that the alligators won’t clack when moved. Why we like it: labebe toy features simple, but effective design which is meant to provide your child with excellent support while it’s starting to walk. This baby walker comes with a big toy chest which your child can use to store it’s favorite toys and then transport them. The toy chest should inspire your child to start walking as it’s the only way to move its toys from one point to another. The baby walker toy wheels feature rubber ring and broad base which serve to protect floors from scratching. Also, the broad base is useful to help your child keep the balance and make the toy cart easy to maneuver. This toy is made of high-quality wood which provides the toy with durability and ensures reliable performance. The toy has a compelling and effective design which encourages your kid to make its first steps. 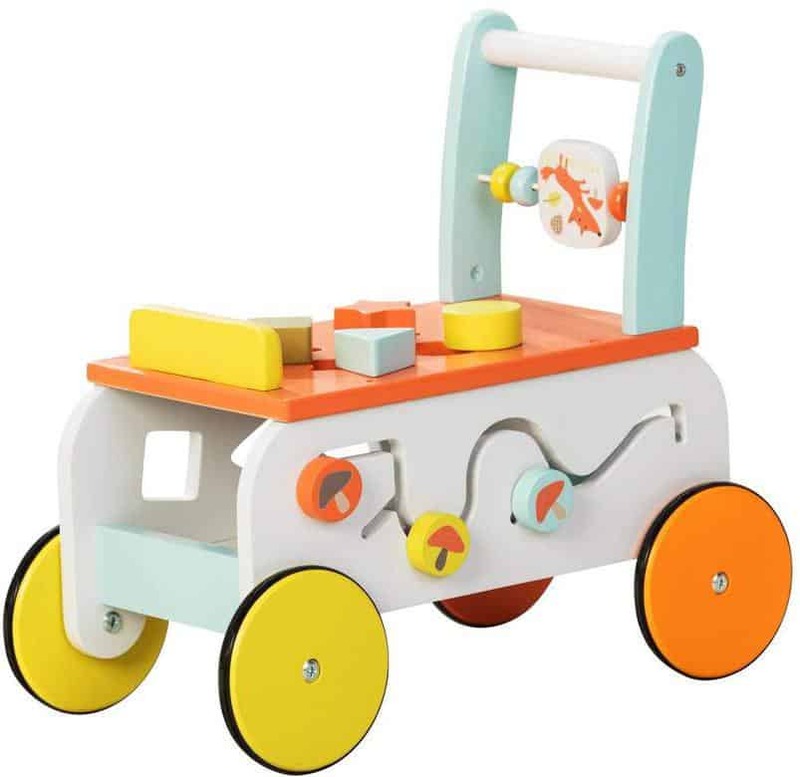 Labebe toy walker is made of durable wood. This toy benefits your child’s physical development. Some users reported small problems with wheels not rotating smoothly. Why we like it: Brio offers a high-quality walking toy for toddlers that features perfect size for kids who just started walking and helps children become confident while making their first steps. This classic BRIO toddler wobbler is equipped with an adjustable ergonomic handle that helps your child keep the balance while walking. Also, the adjustable handle adapts to your child’s development progress and helps to gain confidence while walking. 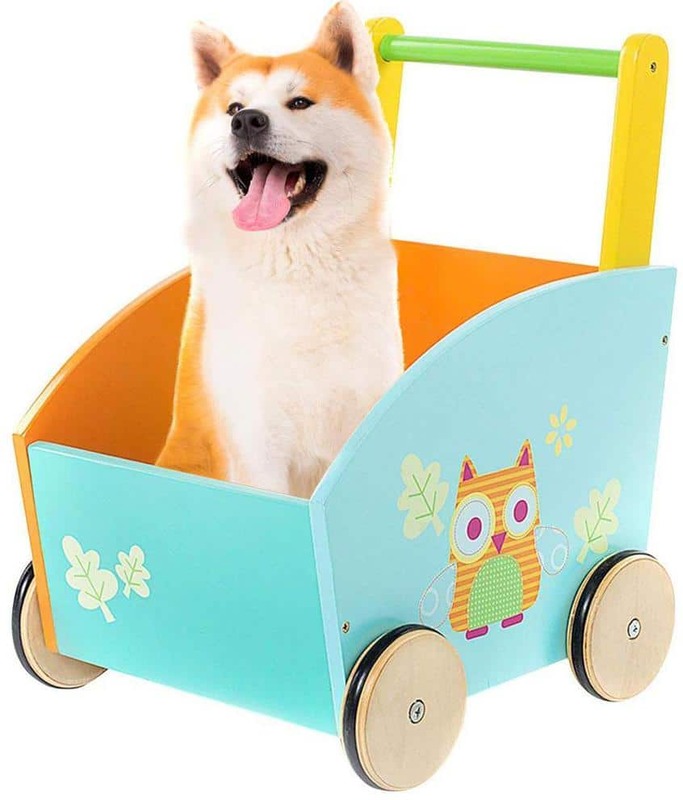 This pushcart toy features a big toy compartment which your child may use to store its favorite toys and transport them to the place where he/she wants to play. The toy is designed to enhance your baby’s senses and spatial awareness as the simple control options prove as beneficial for the child’s cognitive and motor development. The size of the pushcart is meant to support your child during its explorations and adventures. The toy features a great size and an ergonomic handle that provide your child with excellent support while it’s walking. 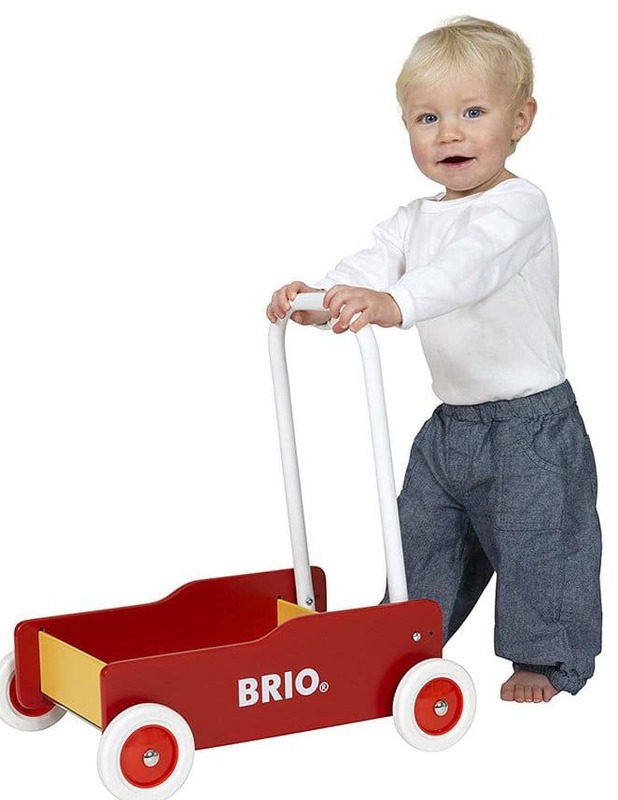 BRIO pushcart is made of high-quality wood that ensures the toy’s long lifespan. This walking toy enhances your child’s physical development. Some users report that the toy is too lightweight. Why we like it: labebe wooden push and pull toy is designed to be both a good walking support for your child and a learning center on wheels. labebe push and pull walking toy is meant to provide your child with fun and engaging support while making taking the first steps. The toy enhances the development of your baby’s essential stability and balancing skills. This activity walker includes 33 pieces of wooden toy blocks that are meant to encourage artistic expression and improve fine motor skills and creativity. 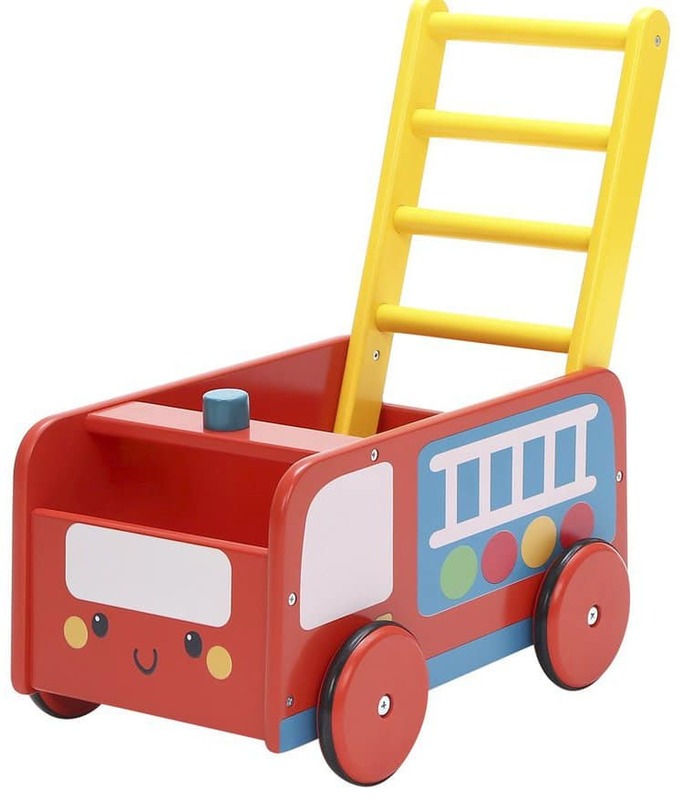 Within the store blocks, this push and pull walker contains a toy storage which proves as useful when your kid wants to gather all its favorite toys and transport them around the place. The baby walker is made of quality wood and contains no toxic materials among its ingredients. The toy comes with an interactive design which is meant to be engaging for young children. labebe baby walker improves your child’s cognitive and motor skills development. This walking toy is made of high-quality wood. Some users reported problems with their child keeping the balance with this baby walker, which means that you need to add extra weight in the toy compartment. Why we like it: infunbebe baby walker comes with a bunch of interesting play options and features that help your child start walking with confidence. This baby walker is made of quality ABS plastic and PP material which odor-free and BPA free. This means that the toy is perfectly safe for use and contains no hazardous ingredients in its construction. The toy features adjustable speed control with a locking design that enables rubberized wheels to grip the ground surface and remain stable. Also, the toy features a ball run panel which is engaging for toddlers as it occupies their attention for a longer period of time. 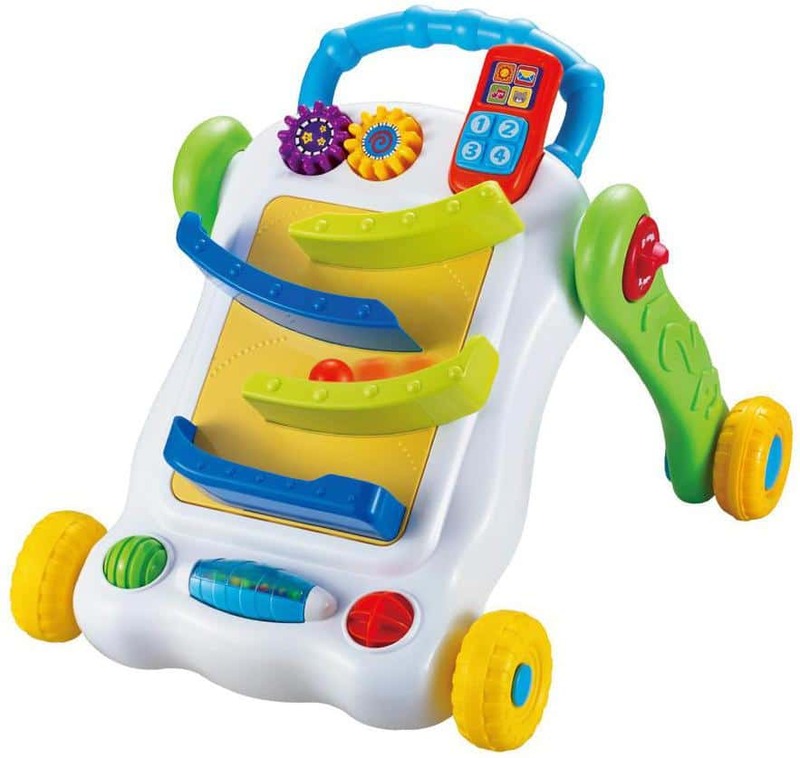 The front panel of this baby walker features a squeaker mobile phone, 2 turning gears and roller balls which all add up to the child’s overall excitement while playing with the toy. The toy is made of children-safe materials. 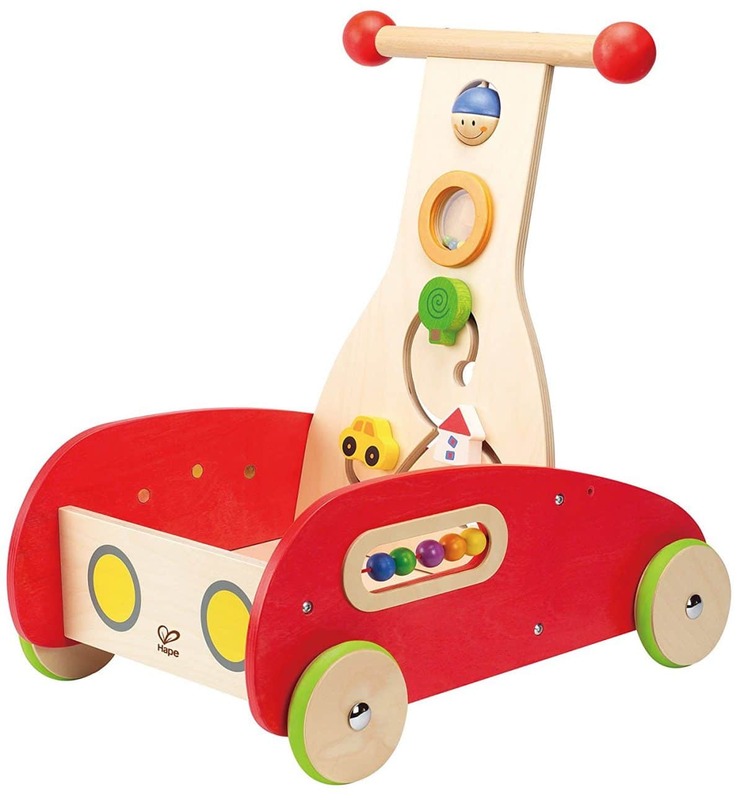 Different play options and functional features make this baby walker engaging for toddlers. The walking toy improves your child’s physical development. You may encounter smaller problems with speed adjustment mechanism. Why we like it: Fisher-Price smart car toy comes with a set of engaging play options that will encourage your child to be physically active and learn to walk. The toy features 3 play modes and it’s designed in a way that supports the toddler’s growth and support them through different stages of development. Fisher-Price smart car comes with an interactive dashboard with lights which are meant to occupy your baby’s attention and inspire to explore the surroundings. Learning content is changing as your baby grows thanks to Smart Stages technology that provides your child with advanced playing options. Your child will be able to turn the wheel, turn the key, “honk” the horn and do many interesting things which improve its cognitive and physical capabilities. This toy product is made of high-quality ABS plastic with no toxic ingredients included. This smart car toy features advanced playing options that encourage your child to be more physically engaged and improve its motor skills. The toy is beneficial throughout different stages of your child’s development. 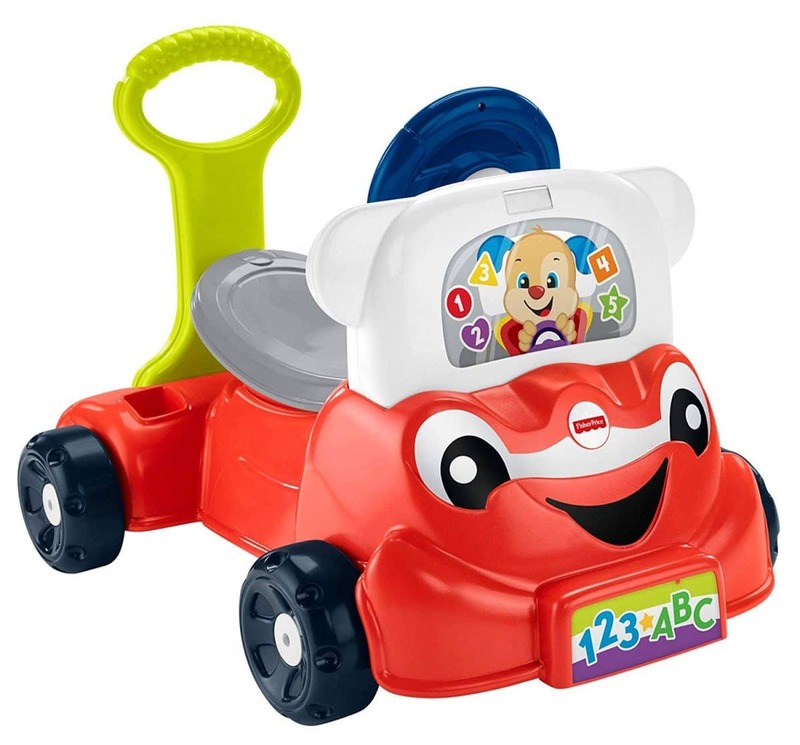 Fisher-Price smart car is made of high-quality plastic material. Although it has a steering wheel, this smart car doesn’t have steering capability. Why we like it: XJD balance bike can crucially improve your child’s motor skills and help to start walking with ease. XJD bike features a modular design which makes this toy easy to assemble and use afterward. To assemble this bike, you will need no tools as the toy is designed to be manually assembled in no time. Toddlers will adore this tiny bike as it will provide them the freedom of movement and improve its motor skills which are crucial for your child to make its first steps. The bike features a safety carbon steel frame, and durable widen silent wheels that are suitable both for indoor or outdoor riding. This toy has enhanced longevity, thanks to the high-quality materials and good construction features. A good design of this toy bike will help your child start walking with ease. The bike features quality construction. This toy bike is easy to assemble. Some users complained about the size of the bike. Why we like it: Hape walking toy is equipped with engaging and well-designed play options that will encourage your child to start walking. 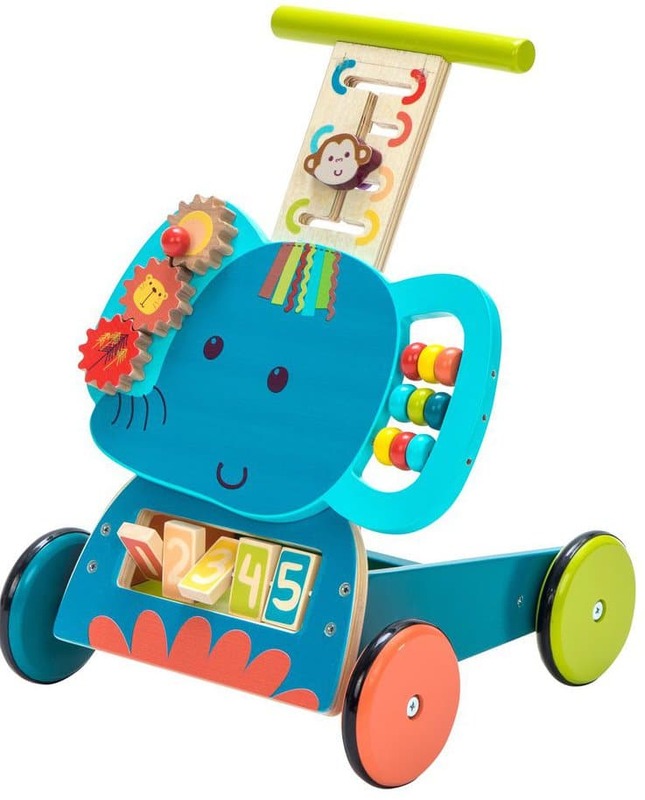 Hape push and pull walking toy features moveable knobs, gears, and colorful balls which altogether provide your child with up to five different play activities. Such activities prove as beneficial for coordination and fine motor skill development that ultimately help your child to start walking. The walking toy is made of sturdy wood from sustainably sourced forests and it features use of child-safe materials during the production with no toxic ingredients included. It will take no more than 15 minutes to assemble this toy and have your child use it afterward. The toy is designed to support your child during every stage of development and to enhance the natural abilities for his/her optimal development. This baby walker comes with engaging play options that motivate your child to be physically active. The toy is easy to assemble. Hape walking toy provides your child with stable support while it’s learning how to walk. Some users reported a problem with back wheels of the baby walker scraping the body. Why we like it: Labebe baby walker features a beautiful red fire truck design and a well-designed handle with 4 handles with a gradual height. Labebe baby walker features a 2-in-1 design as it’s a combination of a big toy chest and a pushcart. Toddlers will have 2 play options as they will be able to use baby walkers to play mode and a stand to walk mode. Stand to walk mode lets the toddlers transport their favorite toys from one place to another, encouraging them to develop walking skills rapidly. The wheels of this baby walker come with a rubber ring which protects the floors from scratches. This toy is made of high-quality wood and includes no toxic materials in its construction. This toy comes with an adorable fire truck design. 2 play modes encourage your kid to develop its motor skills and start walking. The toy is made of high-quality wood. Color may wear off after frequent use. Why we like it: Fisher-Price baby walker comes with a simple, yet advanced design which will help your child start walking. Fisher-price push toy comes with a renewed design which makes the toy more engaging and exciting for toddlers to play with. The toy features ball-popping sounds and interesting activities that will occupy toddler’s attention and make them more physically engaged. Walking and pushing this Corn Popper baby walker toy will help strengthen motor skills that are crucial for the development of your baby’s walking skills. Also, the toddlers will be introduced to the basic understanding of causal relations between things as they will see that its actions produce effects. Bright colors and popping sounds help stimulate baby’s senses and improve its spatial awareness. The new design of a traditional pusher toy is very appealing to toddlers. The toy features many play options and gadgets that enhance your child’s overall experience with the toy. Some users report problems with a popping sound not occurring when the walking toy is moved. Why we like it: Fisher-Price food truck features an interesting design which motivates your child to explore all the play options and eventually start walking. This toy features 2 sides of toddler-friendly play options that come with an engaging design meant to encourage your child to explore. With more than 20 removable play pieces, this toy is meant to provide your child with exciting options and improve its motor skills like coordination. The dashboard is packed with hands-on play pieces like a steering wheel, clicker key, and gear shifter. With 3 smart stage levels, this toy is designed to support child’s growth and provide them with interesting play options throughout different stages of the psychophysical development. The toy is meant to stimulate child’s senses and encourage them to stand up and walk around it to explore all play options. The toy features a unique and engaging design that helps your child’s mental and physical development. 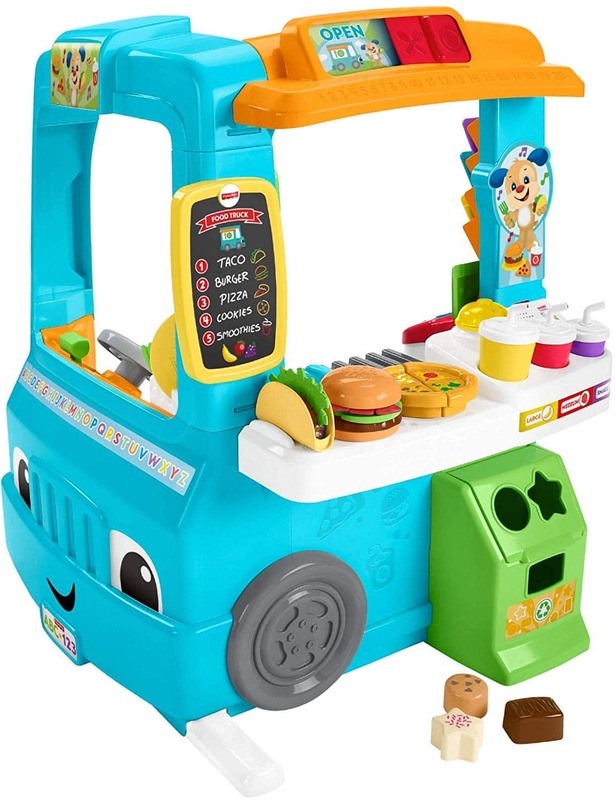 Fisher-Price food truck is made of quality materials that are child-safe. This food truck will motivate your child to stand up and walk around it to explore exciting play options. There is no volume control for the toy sounds. Why we like it: Duck Runner toy features a classic walking toy design which is engaging for a kid who’s trying to make its first steps. Duck Runner baby walker is meant to provide your child with hours of fun and physical activity. This toy features a life-like duck design that young children find amusing and motivating for all sorts of physical activity and both indoors and outdoors. 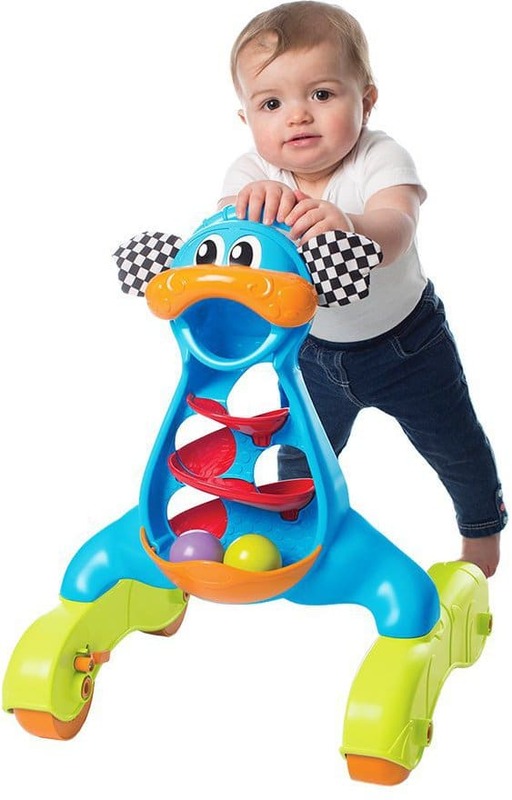 Duck Runner walking toy is designed to develop your child’s balance and coordination as your baby is going to develop fine and gross motor skills to master the use of this toy. The baby walker is made of safe and durable premium northwest pinewood which ensures the toy’s longevity and stable performance. Also, the toy comes fully assembled with an easy grip handle and spinning wheels that make it easier to develop balance and mobility. Duck Runner walking toy comes with an engaging design that motivates your child to start making its first steps with confidence. The toy is made of high-quality wood that ensures toy’s durability. Your child can play with this both indoors and outdoors. The toy’s wheels can’t withstand aggressive use. Why we like it: This colorful and engaging push and pull walking toy comes with a variety of different play options that will motivate your child to start walking. Forstart walking toy comes with specially designed wheels that feature large rubber rings which keep your floors safe from scratches. Also, the rubber rings provide your child with stability and optimized balance as they minimize the friction. The height of the toy handle is adjustable so your child can use the toy as it’s growing. This toy is designed to be a learning center as it features a colorful front panel with a set of engaging play options that will occupy your child’s attention and develop its cognitive and motor skills. The learning center has 5 piano keys that play music and encourage your child’s creativity along with other activities within the activity panel. The toy comes with a colorful design, meant to attract kid’s attention and keep them occupied. With the adjustable handle, your child can use this toy throughout different development stages. This toy is meant to encourage your child to make its first steps. Toy stickers may fall off after extensive and rough use. Why we like it: This toy features a versatile design which encourages different types of physical activity and helps your child learn how to walk. Baby walkers usually feature one specific activity option that is mostly a simple push and pull type of physical engagement, but this roller scooter provides your child with more options. 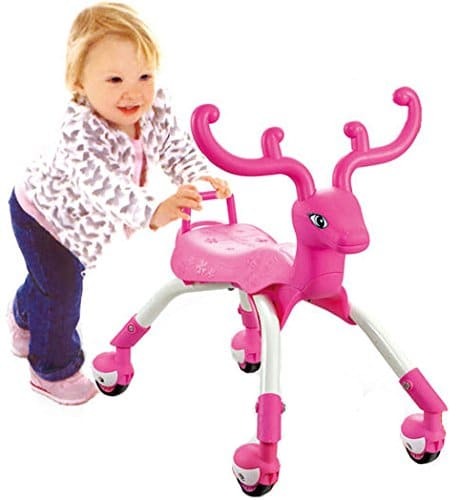 The roller scooter features an adorable deer design which little girls may find especially attractive. Also, the toy encourages your child to make its first steps as it features a push handle on the back of its seat and lets your child use the toy as an action figure. 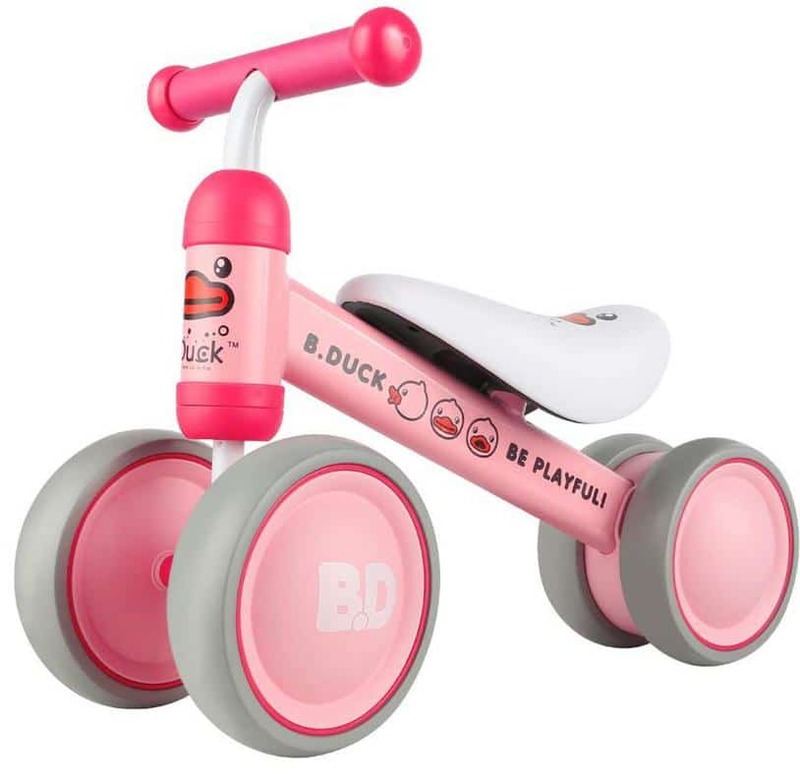 The toy can be used as a bike which your child can drive by pushing it forward with legs. This play mode encourages movement which is crucial for your child to gain confidence while walking. The toy is made of quality materials that ensure its durability and reliable performance. This roller scooter develops your child’s motor skills which prove as crucial for a confident walking later on. 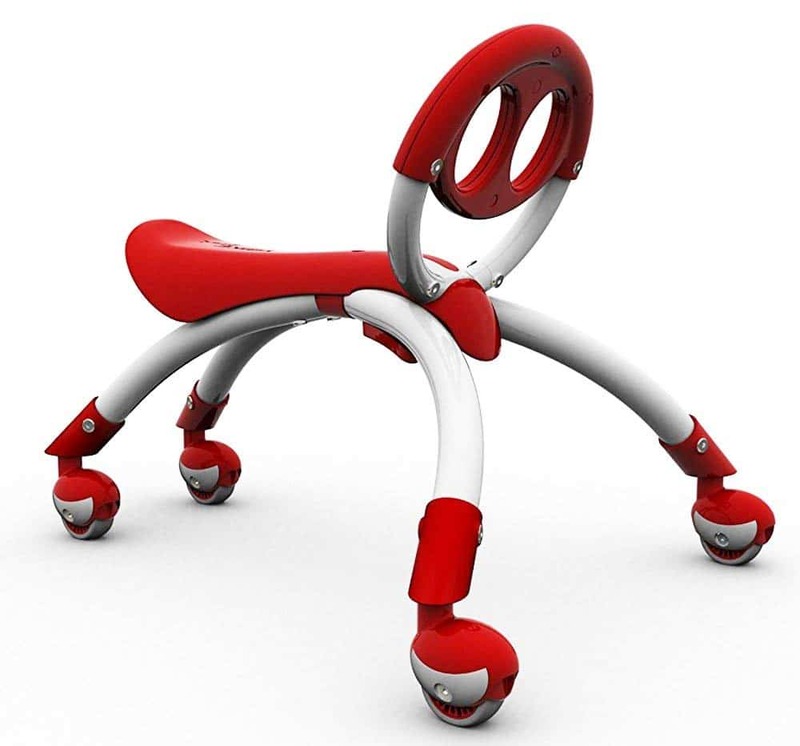 The engaging design will occupy the toddler’s attention and motivate to be physically active. The seat color can wear off after extensive use. Why we like it: Moose Mountain push n’ scoot walking toy for kids comes with quality construction that will support your child while to take the first steps. This push n’ scoot toy comes with interesting play options that motivate your child to be physically active and explore its surroundings. The vehicle features a control panel below the steering wheel which has buttons that activate jungle sounds and lights. Also, easy grip handlebar provides your child with stability and reliable use of the toy as it helps the toddler keep the balance. The vehicle is made of quality plastic materials that can withstand extensive use. Also, the vehicle comes with wide wheels that add up to your child’s stability while using the toy. The toy is designed for children who are 1 year old and up. This toy vehicle gives your child a chance to improve its motor skills and start walking with confidence. Moose Mountain walking toy comes with interesting play options that will keep your child’s attention occupied. Colorful design will motivate your child to be physically active. The toy has a steering wheel, but it doesn’t have a steering option. 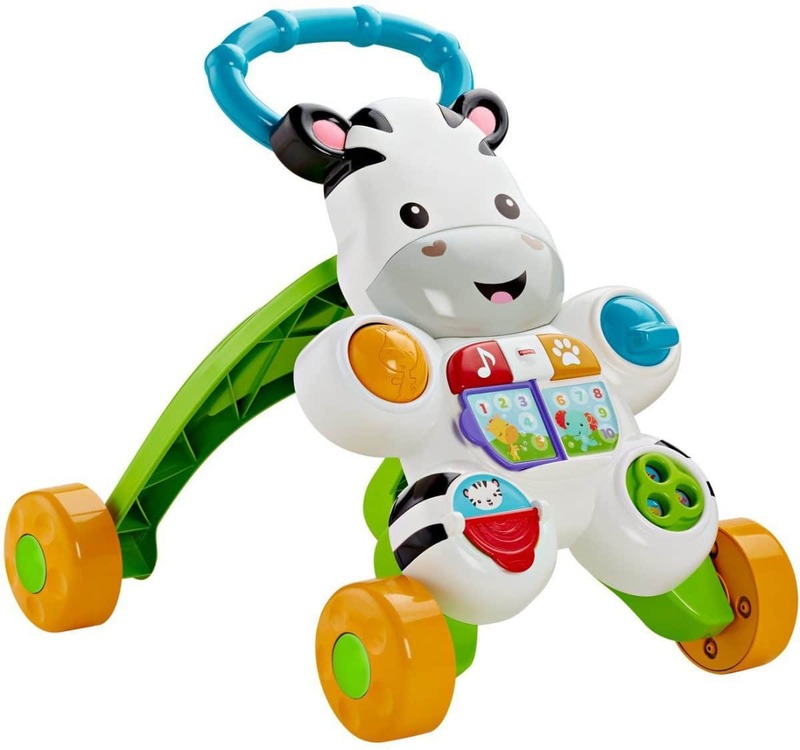 Why we like it: Fisher-Price zebra walker comes with bright and vibrant color design and play modes that encourage your child to develop its walking ability. 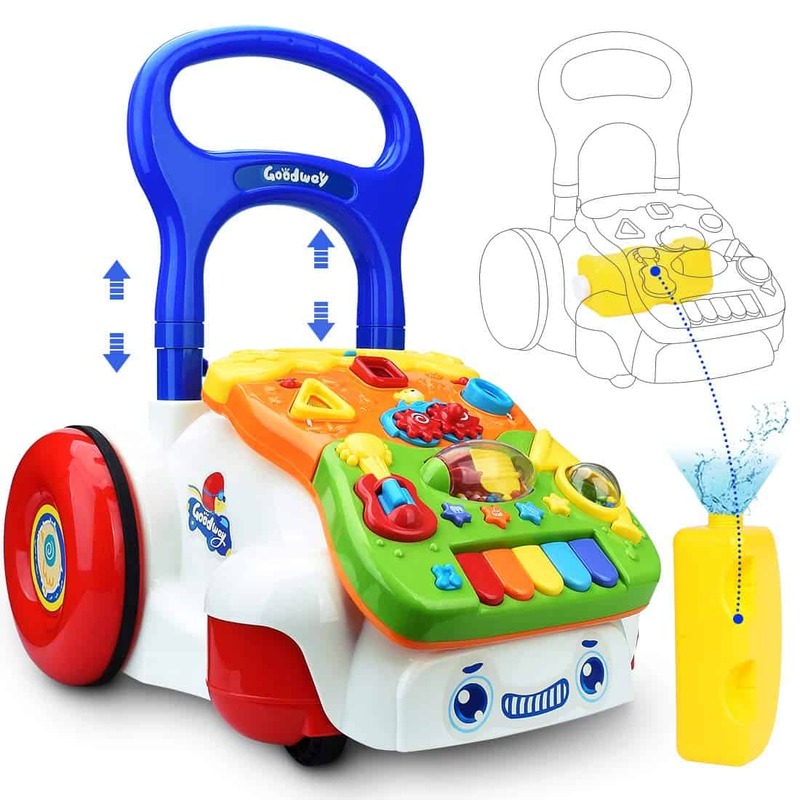 This push and pull toy comes with many exciting play features and modes which inspire your child to explore its surroundings and start walking. There are 2 play modes: sit & play mode, and stand & walk mode, which both have their own specific benefits for your child’s mental and physical development. Easy-grasp handle and sturdy 4-wheel base provide children the stability and help them start walking with confidence. Also, the interactive front panel of the toy comes with fun games that have an educational purpose and help your child develop cognitive skills. The toy is made of high-quality plastic material that is non-toxic and children-safe. The toy features an engaging design, meant to encourage your child’s physical and mental engagement while playing. This toy is made of high-quality material that ensures toy’s longevity. You can’t control the volume of the toy’s sounds. 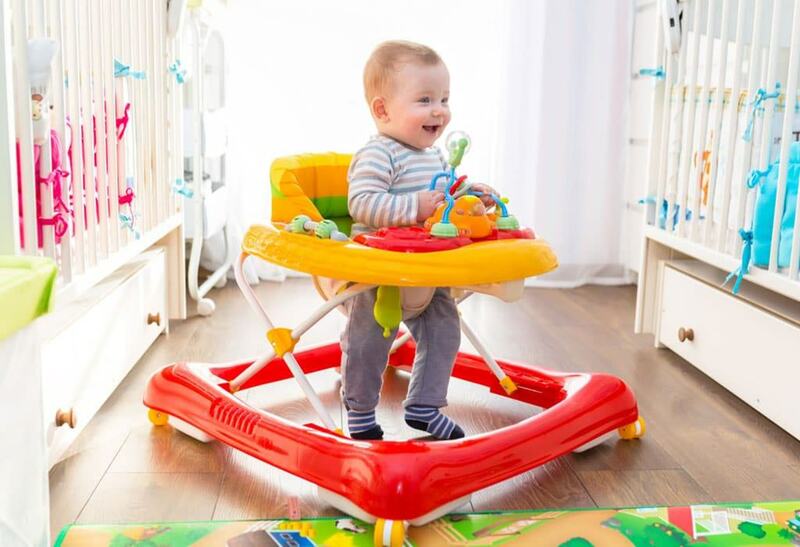 Why we like it: This Fisher-Price toy is a combination of a baby walker and a ride-on toy, which comes with engaging and fun play modes your child will find adorable. 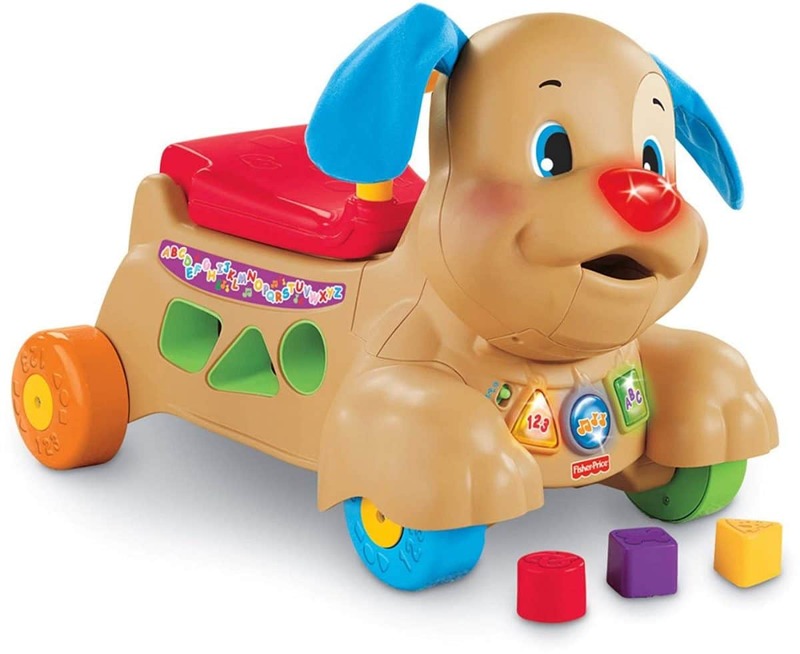 Fisher-Price Laugh & Learn toy comes with a large wheelbase and sturdy handle that makes this puppy toy great support for a child who develops its walking abilities. As your kid pushes or rides along, puppy’s head and ears start to wiggle and the nose and collar light up. This toddler ride-on toy features play options which are designed to improve your child’s cognitive and motor skills, needed for child’s correct psychophysical development. Your child will be able to “feed” the puppy by inserting colorful shape blocks in it. Your child will love this toy’s bright and vibrant design. Fisher-Price stride-to-ride puppy comes with play options that help your child develop its cognitive and motor abilities. The toy is made of high-quality plastic that ensures the toy’s durability and stable performance. The toy may not withstand rough use. Why we like it: Playgro toy comes with interesting play options that encourage the toddlers to explore and help them take the walks. This toy comes with 4 colored balls and a twirly whirly ramp where you can drop the balls in and watch them race. With this play option your child will be able to understand the causal relations between objects and see how its physical actions come with unique physical consequences. The large easy-grip handle provides babies with support as they try to get up and start walking. Also, there is an added break safety feature that slows down movement depending on the developmental stage of your baby. When moved, this toy makes crinkle sounds that your baby will find exciting and it will encourage the child to explore many of this toy’s play options. Playgro toy features exciting play modes that will make your child be both physically and mentally active. Break safety feature provides your child with additional safety support. Colorful and vibrant design will make your child love this toy. Why we like it: Wooden Wonders toy features ergonomic handle design which helps your child improve its balance when walking. This traditional toy provides crucial support and balance to toddlers who are still learning how to walk. The toy is designed to make the physical activity more fun as the toy produces sounds when moved. 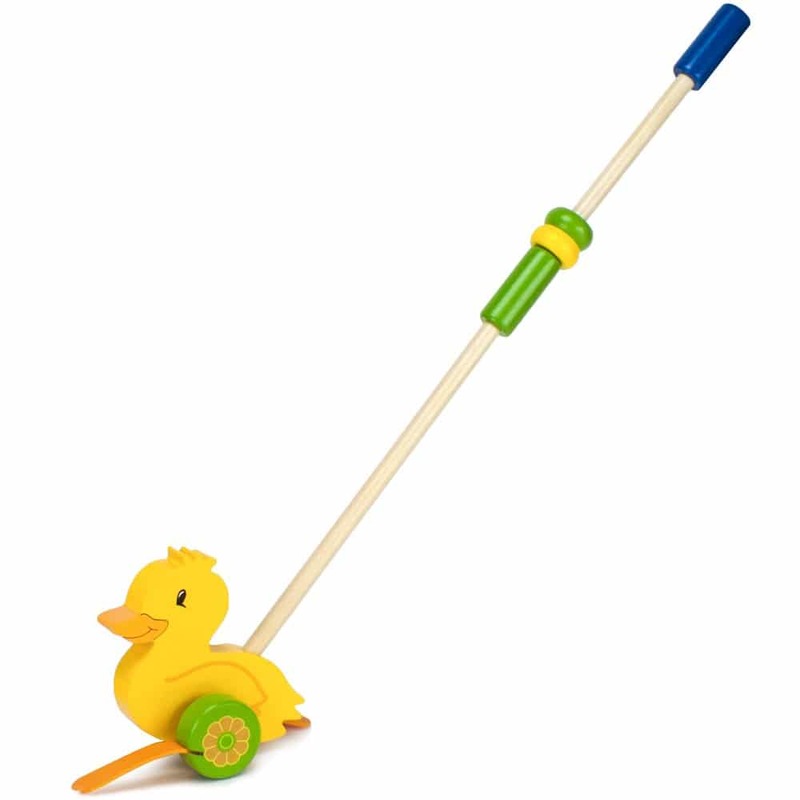 The duckling waddles as your child pushes and pulls it. Two-piece handle is specially designed to provide toddlers with stability while they walk and makes it easier to store the toy when it’s not in use. The toy design features smooth, natural cuts of wood and water-based paint which are all child-safe. This toy is durable and can withstand extensive use. With this toy, your child will improve its spatial awareness and other cognitive and motor skills. The toy comes with ergonomic design, which supports your child when walking. 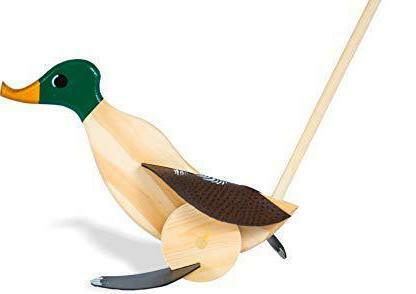 Wooden Wonders push and pull duckling toy produces funny sounds that will inspire your child to be more physically engaged while playing. This toy is made of high-quality materials that ensure its longevity. Some users reported that the toy stops producing waddle sound after too frequent or rough use. Why we like it: This no-pedal bicycle helps your child develop its balance and start walking with confidence. POCO-DIVO bike is specially designed to help your child exercise motor skills which are needed for the correct development of its walking ability. The bike is easy to assemble as it features a modular design that only needs you to install the handlebar with no tools required. Also, the bike features a sturdy structure with a carbon steel frame that ensures the toy’s longevity. This bike comes with steering limitation of 135-degree maximum steering angle to protect your baby from side falling. The toy is made of high-quality materials which ensure its stable and reliable performance. The bike comes with a durable construction that ensures its longevity. With this no-pedal bike, your child will be able to develop balance which is needed for walking. The bike is easy to assemble and store when it’s not in use. Some users reported that the bike’s size became too small for their children after a short period of time. Why we like it: Hape offers a classic push and pull toy that will strengthen a toddler’s balance and help them to walk with more confidence. This push and pull toy comes with a colorful and vibrant design that will provide your child with lots of fun and inspire to be physically active. The toy includes a well-designed handle that provides your child with great support while during those early steps. Also, the toy comes with spinning butterflies, two wheels, and a rainbow-colored flower on the front. The toy is meant to develop your child’s coordination, balance, and motor skills which help your child start walking with confidence. Also, Hape push and pull toy is made of child-safe, high-quality materials which ensure toy’s durability and protect your kid from toxic ingredients. The toy features a great design that will encourage your child to develop walking skills. 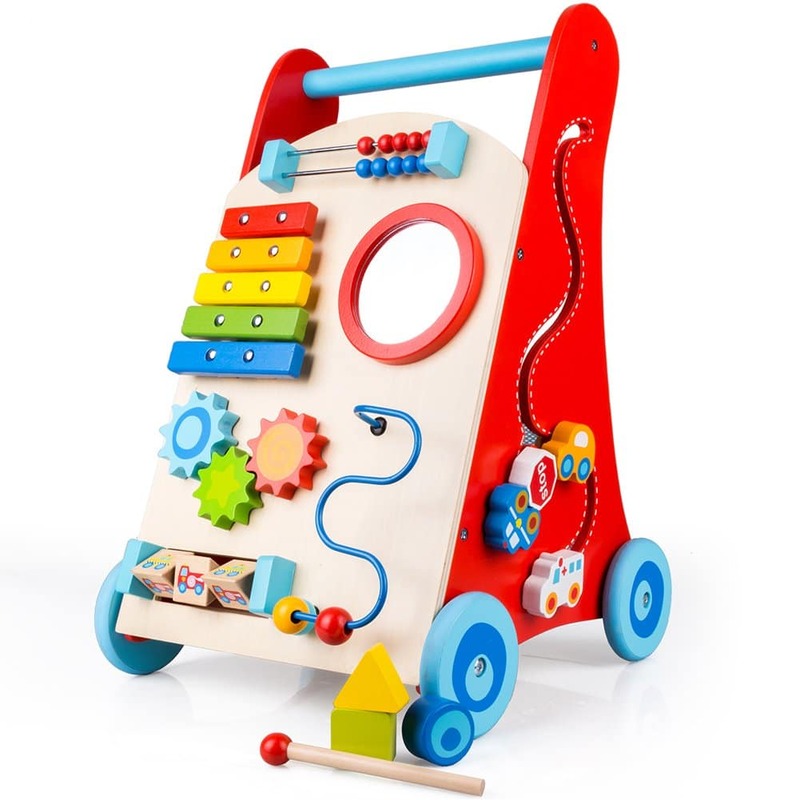 Hape push and pull toy is made of high-quality wood that ensures the toy’s longevity and reliable performance. Various playing option will help the development of your child’s cognitive and motor abilities. Some kids maybe won’t know in the beginning how to get the toy going. 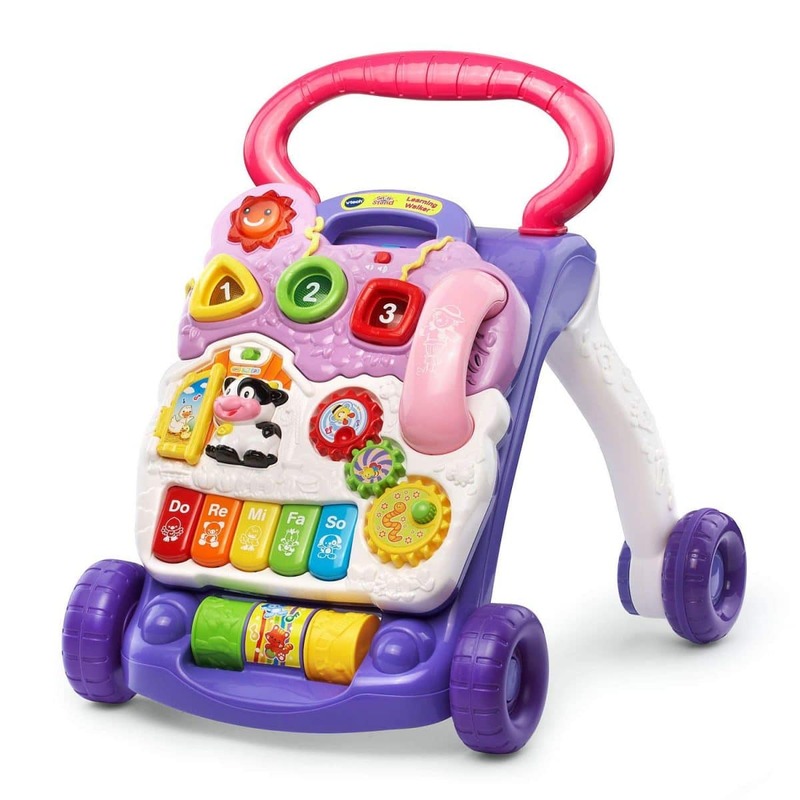 Why we like it: VTech sit-to-stand learning toy is very helpful if you want to enhance your child’s psychophysical development and help take those first walk-arounds. This interactive learning toy has a removable play panel which provides your child with a large set of play options that will keep its attention occupied. Also, early learning center has 5 piano keys that play music and encourage creativity. The wheels will work fine both on carpeted and hard floors as they feature rubber cover that protects floors from scratching. With over 70 sing-along songs, music, sound effects and fun phrases, this toy is meant to enhance the child’s cognitive development and also motivate them to stand on their legs and start walking to have more fun. The toy is made of high-quality plastic that ensures its durability and reliable performance throughout different development stages. The toy comes with a large set of play options that benefit both the cognitive and physical development of your child. VTech learning center will motivate your child to start walking. This toy is made of high-quality and child-safe materials. Some users reported that the toy sounds are sometimes too loud. Why we like it: Costzon baby balance bike is designed to help your child practice leg movements which are crucial for the development of its walking ability. Costzon balance bike is designed to help kids gain balance skills which are important for later development of walking skills. Your baby can go forward and back using its feet and practicing its leg force. 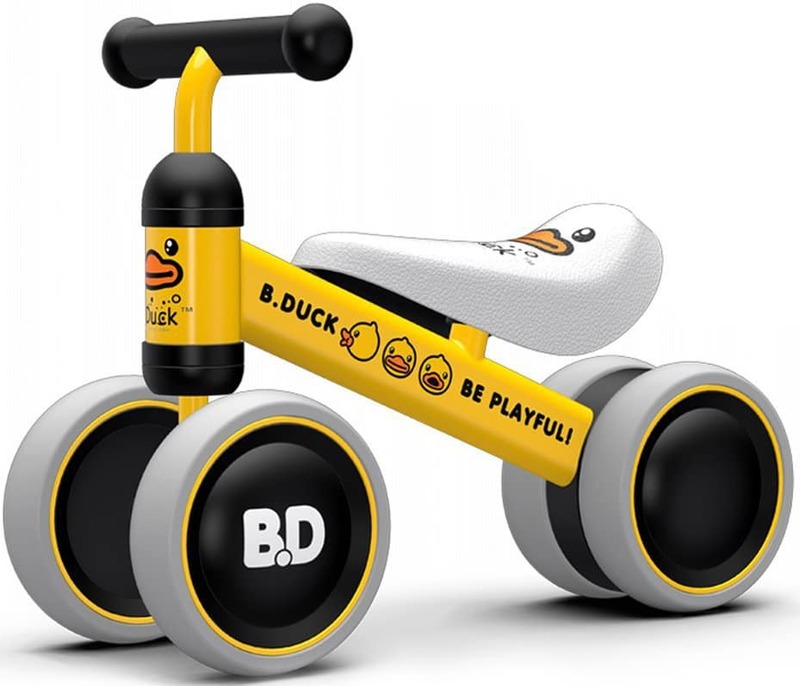 This balance bike is meant to provide children lots of fun and make them physically active. The bike features a 4-wheel design that makes this bike stable and helps your child keep the balance while riding it. Also, the bike comes with durable construction that features a carbon steel frame, and durable silent EVA wheels that also add up to the overall stability of the bike. This balance bike will help your child develop coordination skills which are crucial for walking skills development. The bike features 4-wheel design that provides your child with stability. 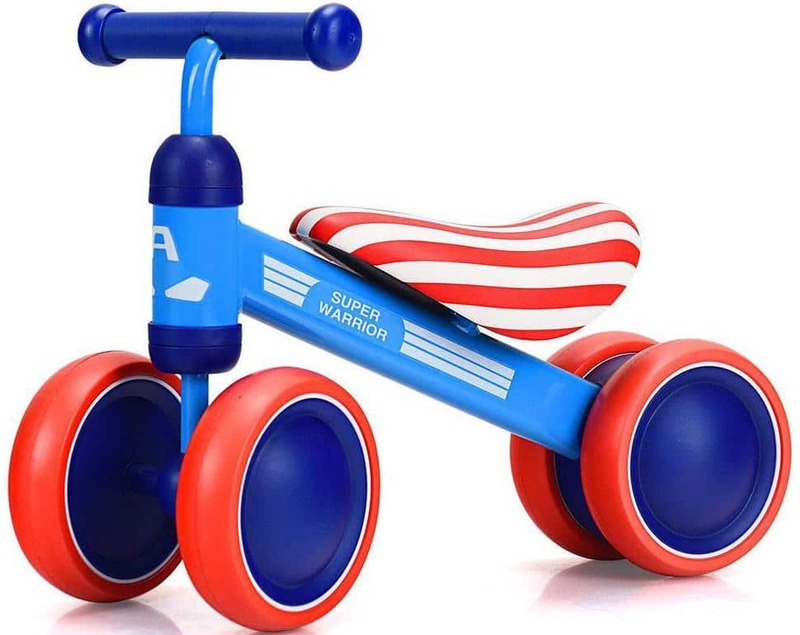 Costzon balance bike is made of high-quality materials and features durable construction. Some users reported problems with the size of the bike that became too small for their fast-growing kids. Why we like it: Fisher-Price musical lion features engaging design that should motivate your child to develop its walking skills with ease. Fisher-Price push and pull toy comes with a great design that features lots of vibrant colors that will keep the toddler’s attention occupied and inspire them to explore different play options. The toy features two different play modes which all provide you with lights, sounds and 8 engaging activities. These play options will benefit your child’s cognitive skills and motivate your child to develop its physical abilities, especially walking. Fisher-Price toy comes with a sturdy 4-wheel base that provides your child with stability and helps to develop coordination skills. The toy is made of high-quality plastic that ensures its reliable performance and longevity. This toy is designed to help your child develop its cognitive and motor skills. 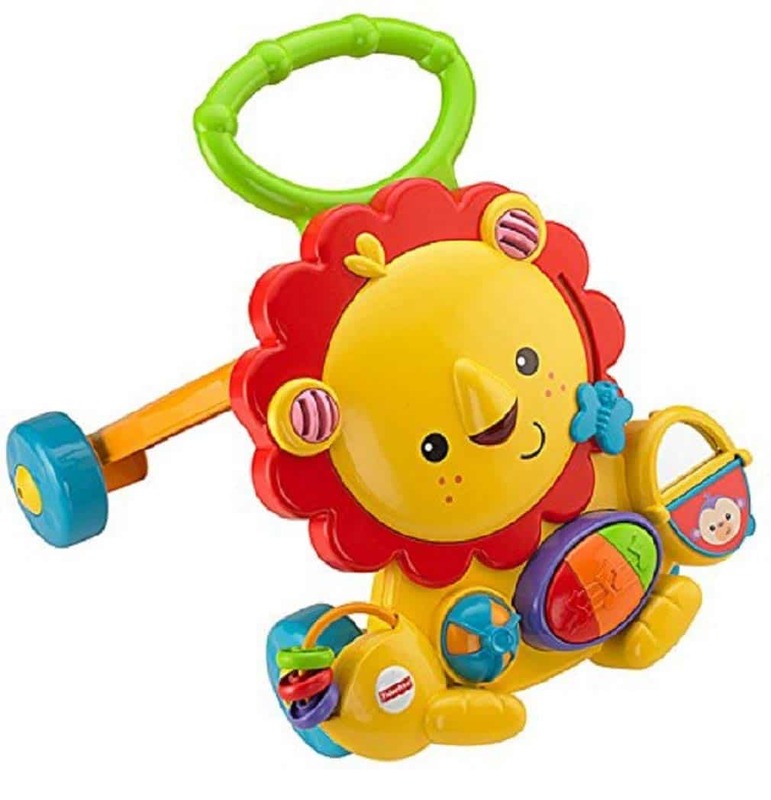 Fisher-Price musical lion toy will encourage your child to make its first steps. The toy is produced of high-quality plastic that makes the toy durable. The toy might be too lightweight for some children. Why we like it: This interesting and unique push and pull toy comes with great play options that will help your child start walking. 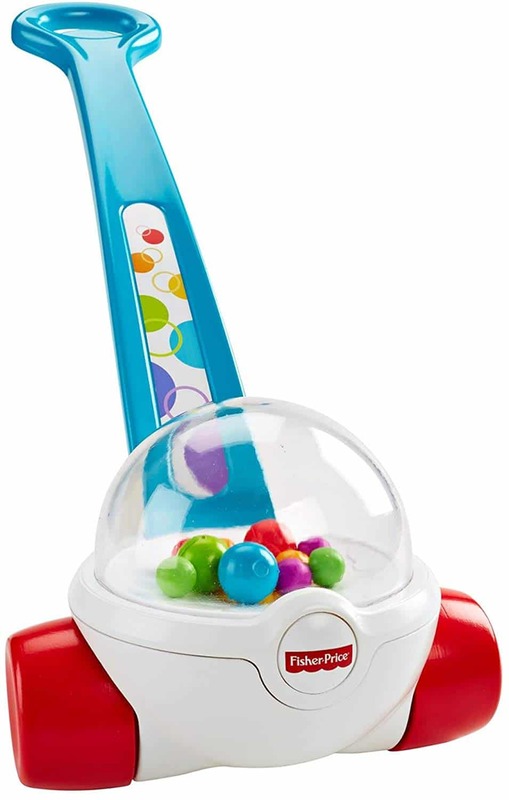 Sunny Days Entertainment offers a well-designed push and pull toy which produces bubbles when moved. This play option will encourage kids to stand on their feet and start walking to make the bubbles all around them. Also, this toy will help the children understand basic causal relations between the objects which is an important thing for their cognitive development. Also, the toy features fun sounds that will occupy the toddler’s attention even more and make them play with this Bubble-N-Go toy mower for hours. The toy is made of high-quality plastic which prolongs the lifespan of the toy and provides you with quality performance all the way. The toy features a unique play option that will inspire your kid to start walking. 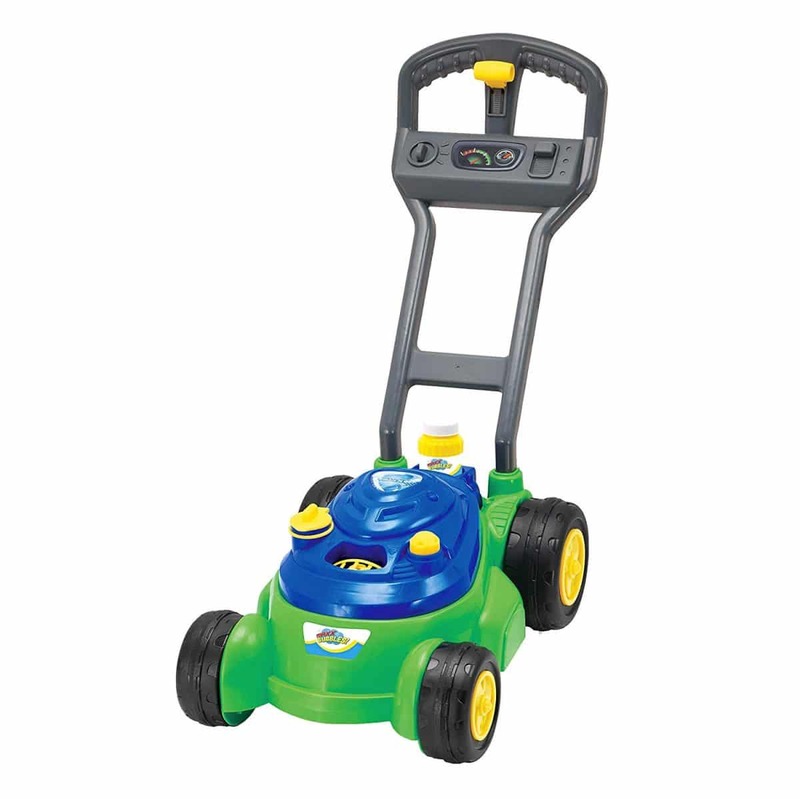 This toy mower will keep your child’s attention occupied for hours and enjoy physical activity outdoors. Thanks to the unique construction, the toy needs no batteries to produce bubbles. These baby toys are crucial for your child’s optimal physical development so it’s of great importance that you find a quality product which can support toddlers and help them learn how to walk. Some of the toys that we reviewed feature a design that is more focused on cognitive development and some toys more encourage the development of motor skills. All in all, before you decide to buy any of the reviewed products, make sure that the toy you want to purchase is suitable to help your child get on its feet and make its first steps. The features which encourage cognitive development are important, but features which encourage the development of your child’s walking ability are even more important.